Fixit Dampshield is a water-based waterproofer for damp cementitious substrates containing up to 50% moisture level. Quick drying - topcoat can be applied during the same day. 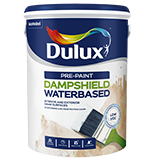 Prevents the effect of penetrating and rising damp.